Every website requires hosting in order to be live on the Internet. Designers and bloggers are well aware of its importance; they use it to establish their brand and business. It is also helpful to stay connected with existing and potential audience. There are plenty of options when it comes to choosing a web host provider. Some are free and offer very limited features while others charge you little but offer unlimited features. I would recommend you to use price-based web hosting because they provide you more facilities than those free or cheap service providers. VPS hosting and Dedicated hosting – best for business purposes that need more server resources. You can get all the help that you want with trained experts ready to help you 24/7. Reseller hosting – best for people who are in web hosting business. You can purchase the reseller hosting and use the allocated disk space and bandwidth to host your client’s websites. Standard dedicated hosting solution will cost you US$74.99/first month. A strong and lighting fast customer service makes this a very strong candidate for your website hosting. With its WordPress experts, you can feel relax about any issues that come to your website. WP Engine is considered a very good option for designers and bloggers who are looking for a Web host provider at a reasonable price. Professional plan with same features as personal plan but more server resources starting from US$99.00/month. Business plan with same features but more server resources than professional plan to host large business websites starting from US$249.00/month. Media Temple offers a world-class hosting experience, especially for designers and bloggers. It doesn’t matter how big your website is, Media Temple can handle it for you. It is the complete value for money. All these features are available in US$20/month. It is easy to use and can be upgraded whenever you think it’s time. Other offered plans are: DV Developer for US$30/month and DV Managed for US$50/month. There are also VPS and dedicated servers that are based on Windows and Linux platform. If you are looking for a simple tool to handle the all the heavy traffic on your website and making sure that website remains online all the time, use Arvixe. VPS hosting for USD $40/month. 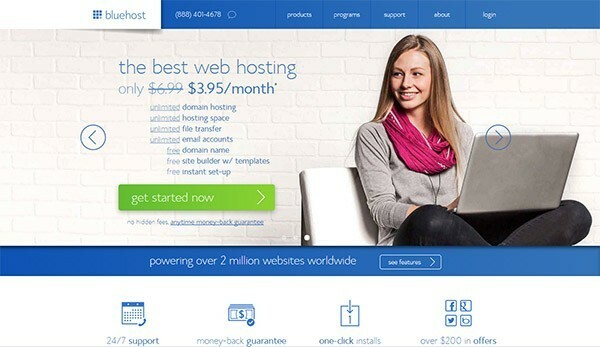 HostGator offers a 99.9% uptime guarantee and a 45-day money back guarantee as well. GoDaddy is one of the most well-known website hosting companies in this industry. Every designer and developer knows about it; it is the number one choice for designers. The service offers plenty of facilities for the beginners and experts. Although these features including many more are available in every plan but prices vary in terms of storage and hosting number of websites. Eleven2 is a highly recommended web host provider due to its service quality, support, hardware, features and uptime. It is very affordable and mostly preferred by designers and bloggers as shared web hosting. It offers a free Site Builder to help you out in creating a fully featured website in few minutes. You can easily manage your site with its standard cPanel tools and features that help you to manage your site easily. With their customer support, they are available 24/7 to help you out. Fatcow is a very good choice for designers and bloggers that have little capital or are launching the website for personal purpose. Its features and plans can keep your website running all the time. People find it very reliable and friendly. Fatcow makes sure that their every customer gets uninterrupted website connection with the help of server backups every day. Dedicated hosting starting from US$119.99/month. InMotion Hosting is very famous among small and large sized businesses. Whether it is website hosting or blog, they can do anything for you. InMotion is very famous due to its award winning technical support and an uptime of 99.9%. They handle every growing business need, from a small business to an enterprise level. InMotion ensures a better speed and high service availability with multiple data centers. It offers a feature called ‘Max Speed Zone’ to VPS and Business class plans with which users that are near to the data centers of InMotion can enjoy browsing six times faster than anyone else. FREE 1-click installer with 310+ applications! When you are running a popular site or a blog, you need various marketing tools and knowledge. TMDHosting makes it easier for you to run a website or a blog. It offers a 30-day money back warranty in case you are not satisfied with the platform. TMD also provides hosting for open source applications including; Joomla Hosting, and Magneto hosting etc. The advantage that TMDHosting has on its competitors is the quick customer support. With 24/7 available support, your inquiries are resolved within 15 minutes. It also offers top level assistance with the latest technologies available. Each web hosting service is highly recommended for you if you are a designer or a blogger. However, I would recommend you to have a close look at each plan to decide which is best for your purpose.Customer support is sometimes the only difference between an ordinary service provider and the best.